Cape Town is currently facing a water crisis. While Day Zero, the day when the city’s water would have been cut off, is apparently no longer a possibility in 2018, scarcity remains a concern. Arguing that water will only get scarcer in the years to come, the Cape Town municipal government response to the water crisis has been to invest in considerable efforts to reduce water consumption, including charging for excess usage and the continued rollout of water management devices for residents deemed to be over users. Additionally, the city has called for the acceleration of augmentation schemes, including desalination and groundwater access. Drawing from climate science and longer term strategies of demand management, the City of Cape Town is attempting to situate reduced demand within a changing climate. 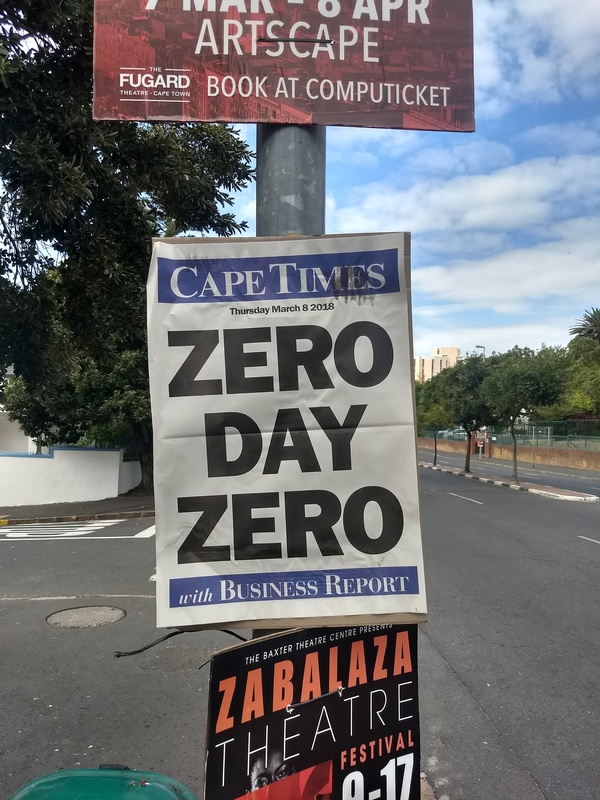 Day Zero Cancelled. Photograph by Nate Millington. 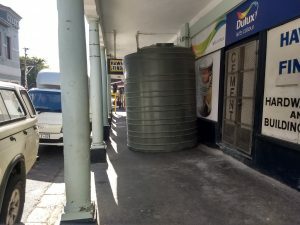 In response to the possibility of citywide water cuts, commentators and journalists engaged extensively with Cape Town’s ongoing water dynamics. Many suggested that the city is a harbinger of things to come in a future marked by climate change and climate uncertainty. Critical to these analyses was the oft-repeated phrase that Cape Town could become the first ‘major’ or ‘modern city’ to run out of water. 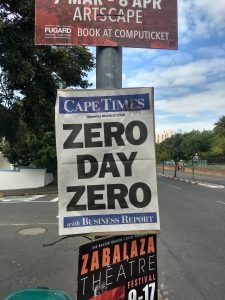 While this possibility appears to have been canceled – or at least delayed – concerns about scarcity continue to mark Cape Town’s political and social life. The idea that Cape Town’s experience with scarcity could become a new normal is reflective of broader anxieties about climate change and changing local and planetary ecologies. Commentators regularly linked water crisis to the threat of global climate change and the overuse of water by urban residents, stressing the degree to which scarcity is constitutive of an unknowable present. While some commentators have situated these anxieties in a refusal of white South Africans to understand that water scarcity marks the lives of many black residents in the city, others have seen the crisis in more general terms. For the city, a focus on specific water targets has largely avoided a deeper conversation about unequal infrastructure and inequality more generally. 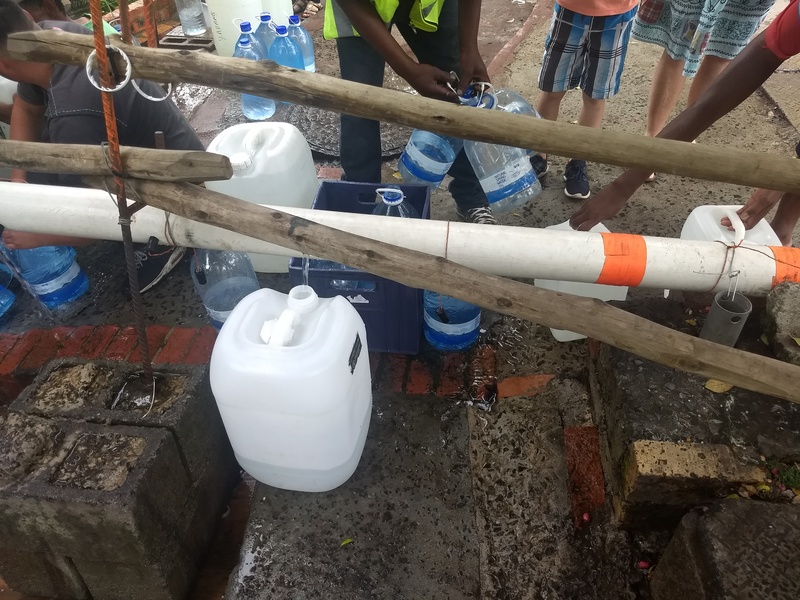 While residents are asked to reduce to 50 litres per day, those with access to boreholes and well points are increasingly able to go off-grid, for example. While this water is not municipal water, it is water that could be used by residents if infrastructures were managed in different ways. Infrastructures are obdurate and hard to change. Managing water is a technical and political process, one that ties together dynamics of land use at the regional level with national, provincial and local funding pressures. These broader dynamics then intersect with smaller-scale technologies like pipes, wells, and water metres. Infrastructures are also reflections of inequality; they determine who is entitled to the benefits of citizenship and, in some cases, modernity. Infrastructure in Cape Town have long been unequal, reflecting longer patterns of apartheid spatial planning and histories of what Stephen Graham and Simon Marvin call ‘splintering urbanism.’ While Cape Town has high levels of water access — nearly 100% – access looks different depending on what neighborhood you are in. As Lucy Rodina argues, a lived experience perspective of water access makes clear that many residents still struggle to access consistent water in ways that are safe and dignified in township communities. Paying attention to the existing geographies of infrastructure makes clear that crises are not momentary events. They are, instead, reflections of longer-term dynamics. They have a temporality, a past and a future. It is important to pay attention to the temporality of crisis, to understand both how crises are produced but also what they make possible in the present and future. It is critical that we understand the relationship between crises and longer patterns of vulnerability: we are not affected equally by crises. Vulnerability intersects with a changing climate in intimate and violent ways. Cape Town’s experience of water scarcity makes this abundantly clear. In a future that may be marked by longer periods of drought, those with the means to withstand scarcity will do so through the purchasing of bulk water, the installation of private boreholes and water infrastructure, and mobility. The rest will suffer. Installing a reservoir in Observatory, Cape Town. Photograph by Nate Millington. Crises have pasts but they also have futures. 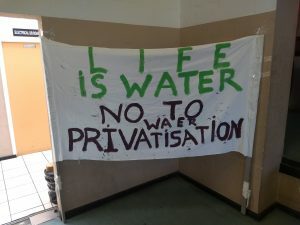 In response to the crisis, activists are currently voicing concern that the crisis may usher in new dynamics of water privatization, linked to the ongoing installation of water management devices and the adoption of desalination technology. In both cases, privatization occurs not necessarily at the level of the water itself, but rather through the technologies and processes that are necessary to access water. 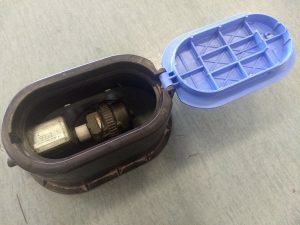 Both involve private technologies that make water available or, in the case of Water Management Devices, periodically unavailable in the form of what activists have termed ‘silent disconnections’. When a water management device has been installed, it is not just the city that can decide to cut off water. Instead, that responsibility is outsourced to a private company through a technological fix. Water Management Device. Photograph by Nate Millington. In the case of desalination, uncertainty marks the technology in myriad ways, including those related to ocean dynamics, the appropriate technological design for the surrounding environment, and funding access for bulk infrastructure. In addition, the adoption of desalination technology will have implications for future water governance within the city as contractors for the temporary desalination plants will be selling the produced water at an apparent cost of R30 to R40 per kilolitre to the city, as opposed to a cost of approximately R5 per kilolitre for surface water. The capital costs of augmentation schemes, and rising cost of water access per kilolitre, are further intensified by the reduction of municipal revenue due to the crisis. Cumulatively these raise a number of questions about the future of water governance in the city, specifically the question of how and by whom these costs will be born. To what extent these changes in the water governance configuration are linked to a broader project of privatization remains to be seen, but these worries deserve attention. As climate change increasingly animates new infrastructural development, it is critical that we push for new equitable infrastructures that do not ask the poor to bear the brunt of a changing climate. More research is needed to understand who is being outfitted with water management devices, and why. These technologies have implications for the equitable distribution of water, and need to be understood in the context of longer term trends of inequality in Cape Town. 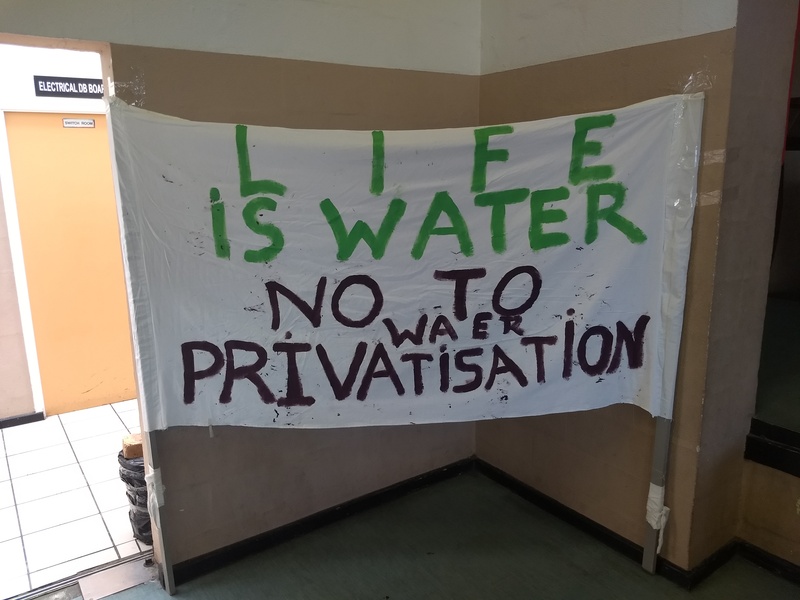 Banner produced by the Cape Town Water Crisis Coalition. Photograph by Nate Millington. Scarcity is not a pre-existing condition but rather a produced reality; managing scarcity in egalitarian ways will require a real engagement with uneven water usage and the politics of rationing. That these decisions are currently a reflection of top-down governance is cause for concern. Cape Town’s water crisis has shown the ways that crises can both heighten discord while also allowing for new opportunities for solidarities and linkages of seemingly divergent political ambitions. Crises are opportunities to reflect on the infrastructures of the present moment. To the extent that Cape Town’s water crisis can create opportunities for reducing water consumption at the city level while increasing consumption for the poor will depend on civil society’s capacity to link the water crisis with the development of political alternatives that prioritize equitable access.